The distinguishing feature of Wickwerks rings is their numerous and dramatic shift ramps on the big ring. The Wick calls this Bridge Technology. 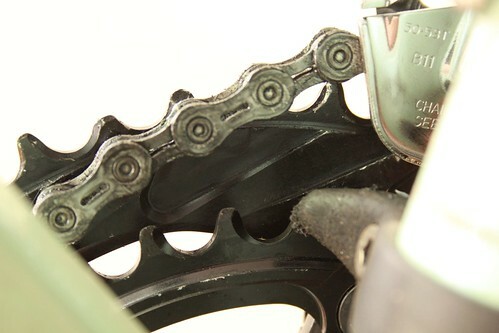 The outer ring’s teeth are also profiled to present gateways for the chain path while shifting. There are no pickup pins. 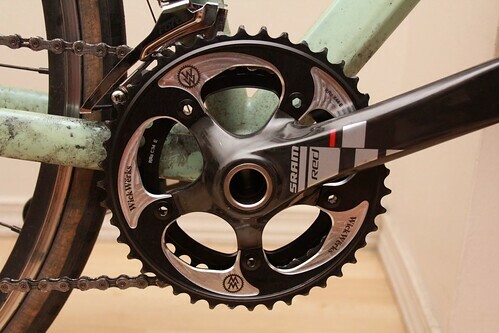 It is worth noting that this American-made chainring set is extensively milled for light weight and gives an overall impression of a refined industrial product, not some guy’s garage experiment. All of this is irrelevant if the fuckers don’t shift when I want them to. They don’t disappoint. To be honest, I tried to make them fail. Before Chris Wickliffe managed to rush me a set from the most recent product batch, I’d been futilely experimenting with other rings for a few days on my SRAM-equipped cx bike, and at that point I was mad. After installing these rings, I took the bike out to see how hard I could pedal while shifting onto the big ring. Normally most riders subconsciously ease off the pressure for a split second in anticipation of a shift, but I just jammed it on purpose. I discovered a limit to the rings’ tolerance, but it took effort. Sprinting out of the saddle, the chain would occasionally bulk, and violent uphill grinds might have a couple of noisy crank revolutions before actually lifting the chain into place. This was while purposely using bad form; in real world riding the shifting of these rings rival the best of Shimano (non-Di2) or SRAM road rings. 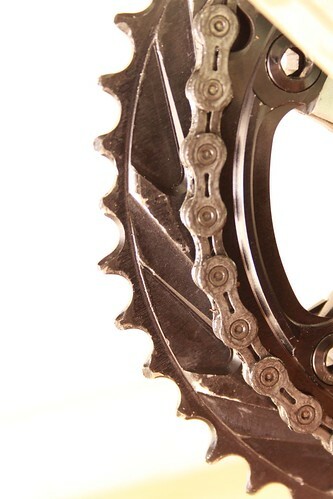 Maybe these rings coupled with a Di2 system I would be able to shift at full power out of the saddle. At about 70-80% full pressure from the saddle, the rings did their job without complaint even without using pedaling technique to help. The bottom line is that I can shift at will, in the heat of the moment, without exaggerated technique or losing momentum. With faith in the front shifting, I can finally use the full potential of both rings. I will update later in the season after I put some significant miles on these rings. I’ll be keen to see how they hold up against wear. My jackass shifting session put a number of visible scratches in the hard anodized finish of the shifting ramps. Well-machined these Wickwerks rings may be, but it’s possible that all the surface hardening treatments that Shimano and SRAM use on their top level rings might actually have a purpose. So far, these Wickwerks CX rings are worthy product for demanding users. It doesn’t hurt that the rings look the biz too.